Trade has always been the engine of economic growth. Individuals and communities that trade successfully with their neighbors gain wealth and power. In precolonial times, Africa’s natural riches gave it an important place in international trading networks. However, the SLAVE TRADE and European colonization profoundly disrupted the development of African economies, and the impact of these events is still felt today. In Africa, as elsewhere around the world, trade arose shortly after humans formed permanent farming communities. Before this development people had spent much of their time securing food to ensure the group’s survival. These settled communities produced enough food and other goods to support themselves, but no surplus to trade with other groups. The spread of AGRICULTURE led to two significant changes in the pattern of economic activity. First, it created extra food that could serve as a commodity for trade with other groups. Second, it allowed fewer people to produce more food, thus freeing individuals to pursue skilled craftwork such as weaving or iron working. The creation of food surpluses and specialized crafts provided a basis for trade between communities. Groups that produced certain foods or goods could trade them with other groups who lacked those items. In exchange, they could obtain things from their trading partners that they could not produce themselves. By the first century A.D., Africans had developed a diverse economy in which people traded and went to markets regularly. Several types of market systems grew up to handle trade in precolonial Africa, and not all of them were marketplaces. Food sellers often visited individual households to find buyers for their goods. Herders learned the times of year when farming villages would have surplus produce and would travel to those villages to exchange meat, milk, hides, and other animal products for vegetables and grain. As the volume of trade in an area increased, people created marketplaces and more sophisticated market systems. One of the most common systems, still popular today, is the periodic market system. In such a system, several villages in the same general area hold markets on different days of the week. Often the system forms a ring around a centrally located village. This central village might hold a market one day, followed by a village to the south the following day and one to the north the next. Such a periodic system has several advantages over a single market. Rotating market days between villages reduces the average travel time to market and the cost of transporting goods. Moving the market from one village to another also expands the circle of people who come into contact regularly. Thus, the market turns into a vital and valuable social space, especially in isolated rural areas. Studies have shown that African women often visit the market where they can see people they want to see and fulfill their social obligations, even if that market is not the closest one. While local trade flourished throughout Africa, regional and long-distance trade developed more fully in western Africa than elsewhere on the continent. The region contained valuable commodities such as gold and salt that merchants could transport easily—ideal goods for long-distance trade. The revenue brought by these goods covered the cost of transporting them and still provided a handsome profit. Trade in western Africa also benefited from the growth of strong, centralized states such as those of the ASANTE and MOSSI. In these kingdoms a separate merchant class arose to sell goods that other members of the society produced. Revenue from trade enabled the kingdoms to build strong armies and maintain control over their subjects. Because these armies also protected traveling merchants, many trade routes ran through these kingdoms. Western Africa had more people living close together than did other parts of Africa. The region’s many towns and cities were natural locations for markets. In some cases urban areas emerged because of the trade: towns grew up along trade routes to serve the needs of traveling merchants and earn money from the commercial traffic. Some townbased markets appeared along the East African coast as well. African trade grew quickly after the development of agriculture around the late 1000s B.C., and by the A.D. 100s merchants from India and southern Asia were traveling to the East African coast. Sometime after the 500s camel caravans from Arabia and the Mediterranean were making their way across the SAHARA DESERT to the gold fields of western Africa. By this time people in western coastal communities had developed trade networks linking them to the interior of the continent. They exchanged fish and sea salt for gold, agricultural goods, and CRAFTS. These coastal communities had their first direct contact with European traders in the late 1400s. The Portuguese built a series of trading posts and forts along the western African coast, between present-day SENEGAL and GHANA. Other European powers, including Spain, France, England, and Denmark soon followed. Although these countries came in search of gold at first, their outposts eventually turned into major centers of the Atlantic slave trade. Until the 1500s Africa was the main supplier of gold to South Asia and the Mediterranean region. But by the 1500s, African gold supplies began to drop off just as Spaniards in the Americas found new sources. Europeans established plantations in the “New World” that relied on large numbers of low-cost indigenous workers to produce high profits for their owners. Because Europeans had largely destroyed some Native American societies through disease, hard labor, and battle, they looked for other sources of workers. They decided to bring in enslaved Africans. A limited trade in slaves already existed within Africa, and slavers from Arabia also took some captives from East Africa to the Middle East. But the demands of plantation agriculture in the Americas gave rise to a slave trade of enormous scale, far greater than anything that had occurred up to that point. Between 1500 and 1850, the transatlantic slave trade forced more than 13 million Africans to leave their homelands. Many died on the slave ships crossing the ocean. Although trade played a key role in the culture and economy of precolonial Africa, its growth was hindered by the continent’s challenging landscape. Geographic features such as deserts and jungles made transporting goods across the land extremely difficult. However, most items had to be taken overland because few rivers allowed long-distance travel by boat. In most cases merchants hired or enslaved people to walk and haul goods on their heads or backs, a form of transport called porterage. Because humans cannot carry great weights, porterage limited the distance a merchant could go to market and the amount of goods he could take. Africa did have pack animals, but many areas also had the tsetse fly that carries a deadly disease called sleeping sickness. Animals cannot survive long in the tsetse zones, so traders did not use animals or wheeled carts and wagons widely in precolonial Africa. Because of these difficulties, long-distance trade was only profitable for goods, such as gold, that had great worth relative to their size. Food, tools, and other everyday items did not have enough value to justify the expense of transporting them to distant lands. People traded them only at local markets. In 1807 Great Britain outlawed the slave trade and began to police the slave trading activities of other countries. As a result, European interest in Africa shifted from the export of slaves to the exploitation of natural resources. European nations began to explore ways of profiting from Africa’s agricultural and mineral wealth. To tap Africa’s natural riches, Europeans first had to gain control over them by conquering the indigenous peoples and seizing their land. Colonial authorities then gave the property to companies or individual settlers. Colonial plantations soon produced coffee, tea, spices, and even vegetable oils for lubricating the new industrial equipment produced in Europe. Other companies opened large and dangerous mines to extract copper, gold, and other valuable minerals for export to Europe. To speed the transportation of raw materials, colonial powers built roads and railroads to connect interior areas to the coast. These projects dramatically reduced the cost of bringing goods to ports for shipment to Europe. Ports with rail connections swelled into large cities that dominated the commercial activity of the colonies. Meanwhile, settlements at a distance from rail lines suffered economically. The colonial economy had devastating effects on Africans. Deprived of their land, many were forced to work on the plantations and in the mines for little pay under brutal conditions. Workers often had to travel great distances to work because a colony’s economic activity was usually concentrated in a few areas of intensive production and one or two large cities. Families were frequently split up as men found work on plantations, in mining camps, or in towns while other family members remained in the countryside. Colonial trade policy also undermined the African economy. The raw materials so cheaply produced did not go to make goods for local use. Instead the materials were sold to Europe, where the new industrial cities turned them into manufactured goods that were shipped back to Africa for sale. Colonial companies made enormous profits with this system. By contrast, colonial governments neglected African industry to prevent local competition for European goods. By the time most African countries won independence, their economies were almost totally dependent on raw materials. This situation led to serious problems in the following years. At independence, most African economies had little industrial development. The selling prices of their raw materials could swing up or down unpredictably, and these price changes could create an economic boom or bust with unsettling speed. In addition, the transportation infrastructure served few areas within each country. Although they achieved political freedom, African nations continued to struggle under economic burdens caused by the policies of their former colonial masters. Throughout the 1960s, high prices for minerals and agricultural products led to economic growth in Africa. However, a fall in commodity prices and a sharp increase in the cost of fuel oil crippled many African economies in the early 1970s. Earning little from exports and forced to pay high prices for imports, African economies went downhill rapidly, and local currencies lost much of their value. Many countries borrowed money from the World Bank and the International Monetary Fund, but few could repay even the interest on these loans. Meanwhile, African leaders tried to develop industry in their countries. Many leaders hoped to limit the role of foreign corporations, but few local companies had the funds to launch major projects. Many governments formed state-owned corporations to handle utilities, infrastructure, and other needs. Unfortunately, most state companies proved highly inefficient or corrupt. 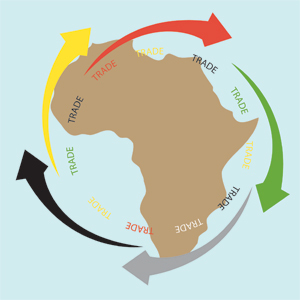 African industries are still struggling to make inroads in international markets, and multinational corporations continue to dominate trade within Africa. In the 1980s and 1990s, the World Bank and International Monetary Fund demanded that African nations restructure their economies to earn money to repay their loans. Many African leaders continued to push agriculture and industry toward exports, while removing barriers to imports. They also cut spending on social programs such as health care and education and cut the value of their currencies. As a result, Africans lost services and purchasing power and services, and unrest in urban areas grew. To lessen the demand for increased wages, governments artificially lowered the price of food. However, this hurt local farmers, who began to withhold food from the regular market and sell it in illegal markets where they could get higher prices. Despite efforts to diversify their trade economies, most African nations still depend heavily on the export of raw materials. Agricultural products make up the bulk of these exports, accounting for more than 80 percent of foreign revenues in some countries. For most of these countries, exports are a trap from which they seem unable to escape. Mineral resources are the other mainstay of African overseas trade. In NORTH AFRICA, the nations of LIBYA, ALGERIA, and TUNISIA rely on revenues from petroleum and natural gas. MOROCCO and Tunisia export large amounts of phosphates, a major ingredient of fertilizers. NIGERIA managed to produce and export oil in the 1970s, but corruption has drained much of that wealth from the public treasury. In southern Africa, BOTSWANA has developed diamond, copper, and coal industries. SOUTH AFRICA is also a world leader in gold and diamond production.